The Sunbeam Gallery, located in San Ildefonso Pueblo in the Northern Rio Grande Valley of New Mexico, serves as a dedicated, micro gallery showcasing the works of 4th generation Maria Martinez potter Barbara Gonzales (top right) & her sons (the eldest, Cavan, is pictured next to Barbara), down to some of the 6th generation in Barbara’s grandchildren. The family carries on the proud tradition & technique of the black style pottery revived by Maria & Julian Martinez in the early 1900’s, as well as the traditional red style and polychrome style. The Sunbeam Gallery can trace its existence back to the early 1970’s starting life as a small, unused, traditional one-room house on the North Plaza of San Ildefonso. 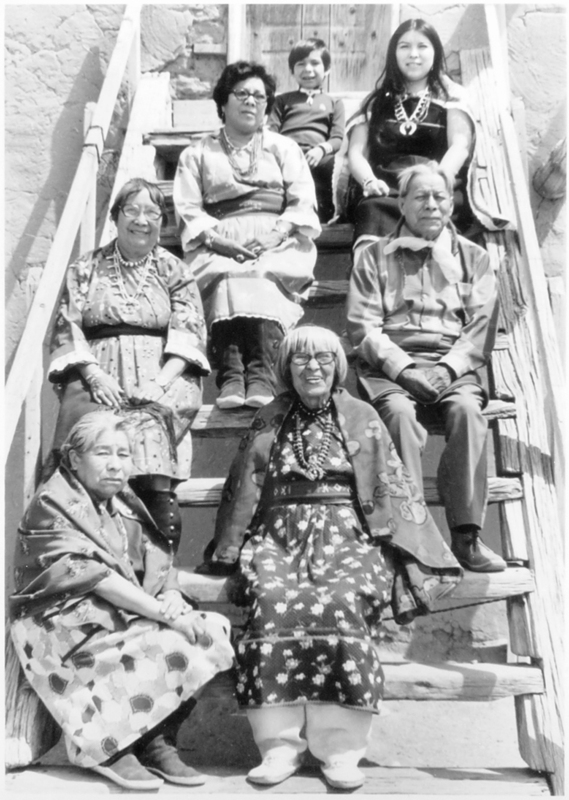 Belonging to Santana Martinez, wife of Adam Martinez; their eldest granddaughter, Barbara Gonzales (Tahn-Moo-Whé, Sunbeam), a potter in her twenties at the time, asked for permission to use the building as a simple candy & snack shop for the children of the pueblo. Occasionally a visiting tourist would walk in and inquire about the potters of the pueblo. Barbara, being a direct descendant of the famed pueblo potter Maria Martinez as well as a pupil to both her & Santana, began displaying a few pieces of her own work in the small shop. As time would tell, it proved to be better than worthwhile, as it not only allowed Barbara (a young mother of, at that time, two boys) a means to extra income, it also allowed Adam & Santana a direct outlet to sell their pieces as well. It proved to be a solid decision and the property began to evolve into more of a gallery, while staying true to its roots as a candy & snack shop for the pueblo children. It remained functioning as such until the early 2000’s, at which time the business was moved to its current location off of the plaza & onto the Gonzales property. Affectionately the old building remains known as the Village Store by all those old enough to remember buying candy & snacks from it.